Google officially announced the Nexus 7 tablet at the Google I/O Developer Conference in San Francisco. 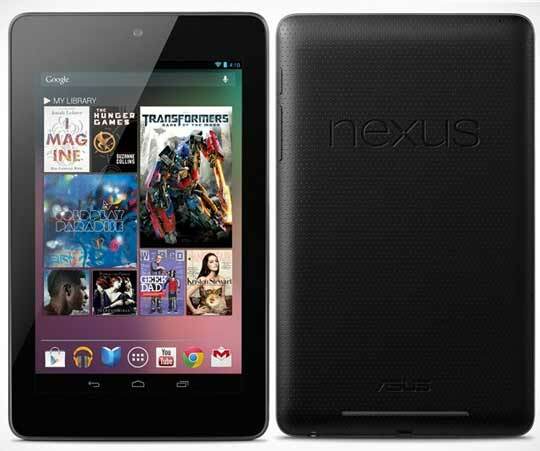 As the name suggests, the Google Nexus 7 features a 7" IPS display with a resolution of 1280x800 pixels. The tablet is powered by a 1.3GHz quad-core Tegra 3 chip with 1GB of RAM and 12 core ultra-low voltage nVidia GeForce GPU. Despite of capable hardware, Google managed to keep the price of the Nexus 7 impressively low. The slate will come in 8GB and 16GB versions, which will be sold for $199 and $249 respectively. Asus is making Nexus 7 tablet for Google. Sadly, there isn’t a 3G model available, but obviously keeping the price as low as possible was key here. Measuring 198.5 x 120 x 10.5 mm the 7-incher weighs in at 340 grams which is respectful for its size. The Google Nexus 7 comes with Wi-Fi a/b/g/n, Bluetooth and NFC connectivity and Google Wallet preinstalled. That's also the reason there isn't a camera at the back, and only a 1.2MP front-facing snapper. However, it's capable of shooting 720p video, so it's not all bad. The Google Nexus 7 is already available for pre-order in UK, US, Canada and Australia and should ship in mid July. You can follow this link to book your Nexus 7 unit. More countries will follow soon.